This newly designed 1 oz. Buddha PAMP Suisse Silver Bar is composed of 1 ounce 999.9% fine silver. The Buddha Bar is one of five bars released as part of the PAMP's religious series, each bar has been uniquely designed in celebration of different religious figures, monuments and icons. The word Buddha means “awakened one” or “enlightened one”, born in Nepal in the 6th century B.C., Buddha was a spiritual leader and teacher whose life serves as the foundation of the Buddhist Religion. 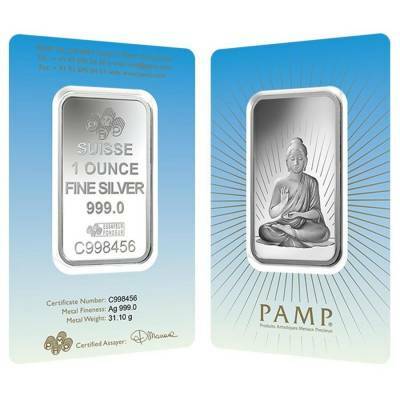 The reverse side of this bar captures the image of Buddha surrounded by diagonal lines. The obverse side features a circular PAMP logo, along with the words “SUISSE” ” 1 OUNCE” “FINE SILVER” “999.0” and an individualized serial number. 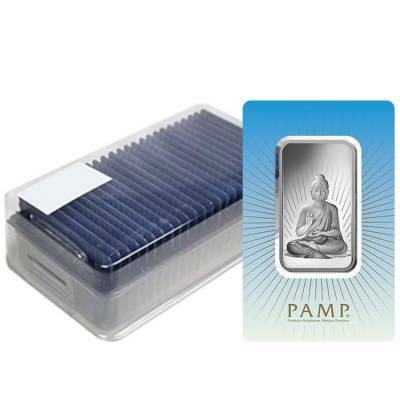 This bar is packaged in its original assay card which guarantees the metal weight and purity. This is the reason I keep coming back to Bullion Exchanges, great service fast shipping, and great quality! Keep up the good work Bullion Exchanges! These bars are outstanding in their creative presentation! Awesome design! 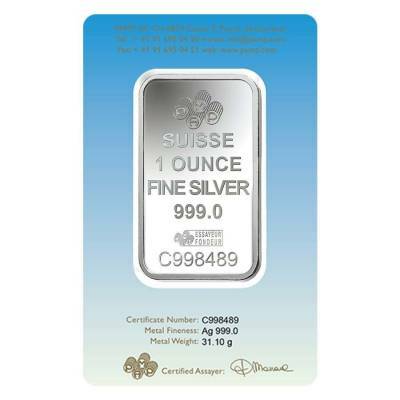 This is my second purchase with Bullion Exchanges and so far they go above and beyond my expectations. 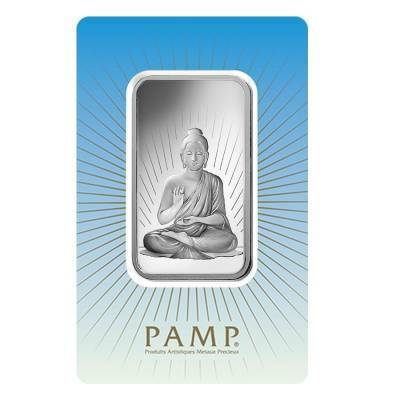 I love all PAMP products , the detailed craftsmanship of their bars is incredible! 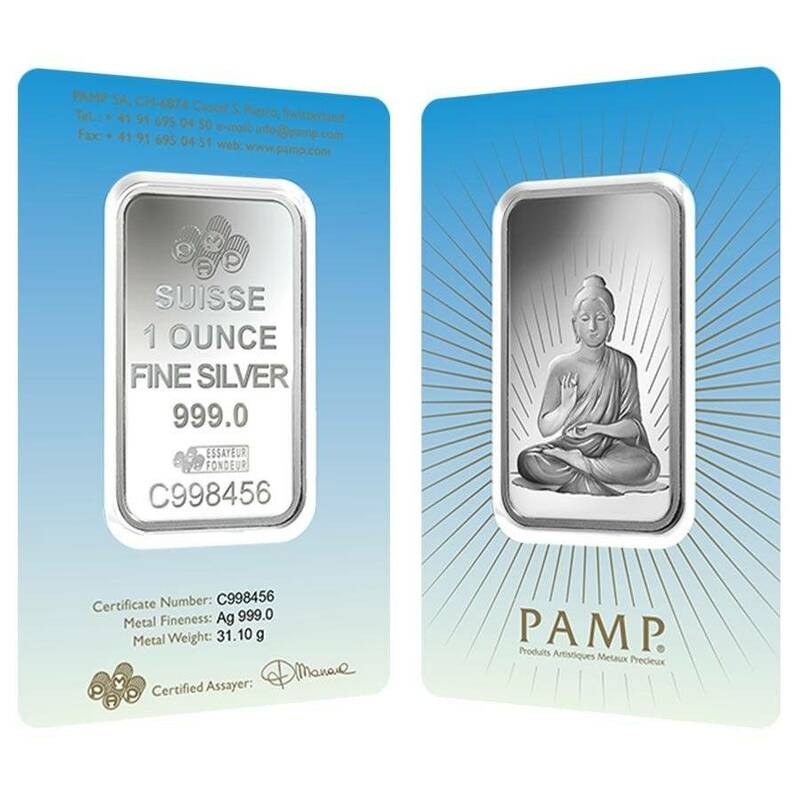 I purchased this and the entire religious series from Bullion Exchanges, and just as described they arrived in excellent condition and sooner than I expected. Thanks for a top notch transaction BE! Received in great condition and quickly, thanks for the great service and a smooth transaction! With this purchase, you earn 31 Bullionaire Bucks 31 BB = $0.03. For every $1 spend, you will earn 1 Bullionaire Buck which is equivalent to $0.001 off a future purchase. 31 BB = $0.03.